Are you weary from wandering the wilderness, battling the loneliness of leadership, seeking solace as a single? This inspirational companion book will empower your faith and propel you from breakdown to breakthrough! Bishop T.D. Jakes walks with you through the perplexing seasons of life when you feel persecuted and in pain. His striking reflections will bring strength to your spirit and emotional liberty. This book provides daily inspiration from a man who shares his personal struggles to help those desperate for the Lord's comforting touch. With a powerful anointing, T.D. Jakes has been firmly entrenched on the best seller lists since his first book, Woman Thou Art Loosed. 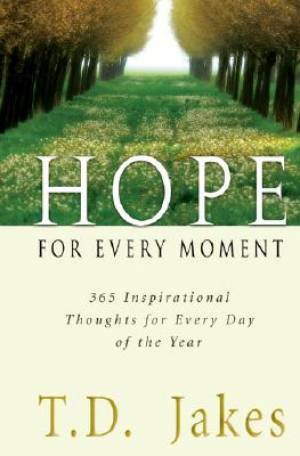 Hope For Every Moment by Jane Hamon; T. D. Jakes was published by Destiny Image in June 2007 and is our 31759th best seller. The ISBN for Hope For Every Moment is 9780768423976. Be the first to review Hope For Every Moment! Got a question? No problem! Just click here to ask us about Hope For Every Moment.